The 9th Day of the 1st Lunar Month is the birthday of Jade Emperor, and is considered by many Chinese to be the most important day. Hokkiens hold the Jade Emperor, who commands all Heavenly deities and Earthly beings, in great respect and would use sugarcane as an essential offering. Sugarcane when pronounced in Hokkien rhymes with “thank you”. Thian Hock Keng celebrates the birthday of Confucius by extolling the virtues of Confucius teachings and values. 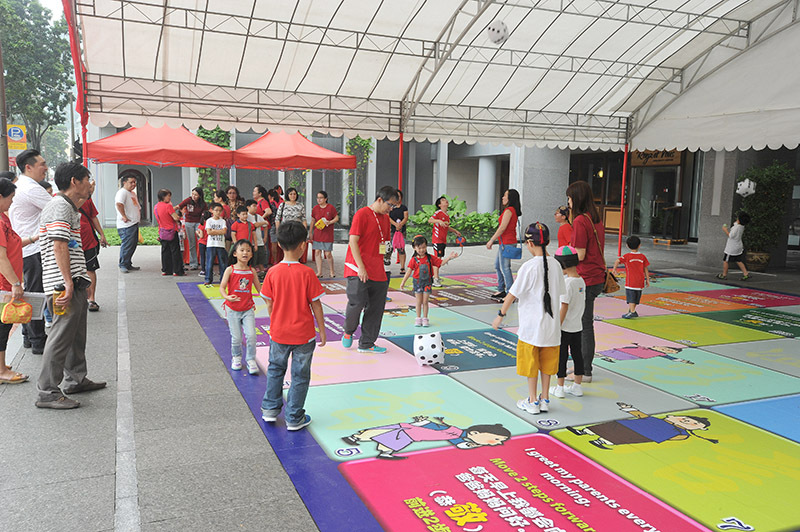 Interactive games advocating Confucius values are held for devotees to participate and to learn more about His teachings. Exhibitions are also put up to introduce and explain his life, teachings and values. 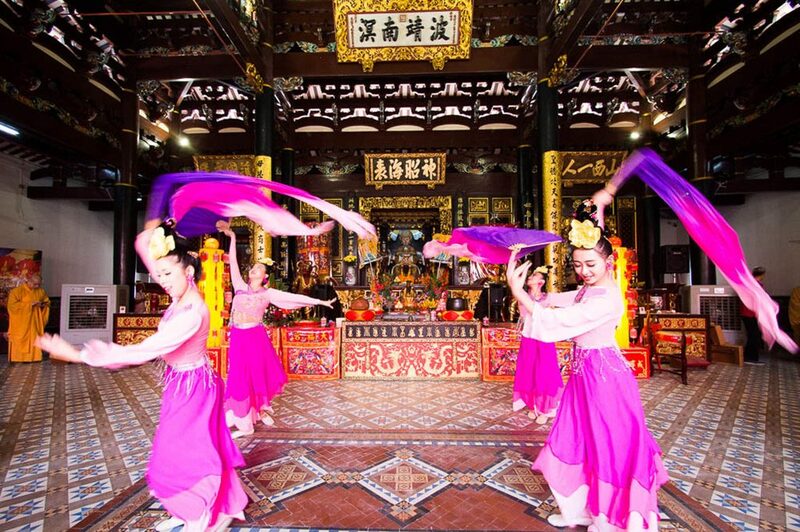 A traditional Chinese dance inspired by a classical court dance (六佾舞) is performed during the Birthday of Confucius. 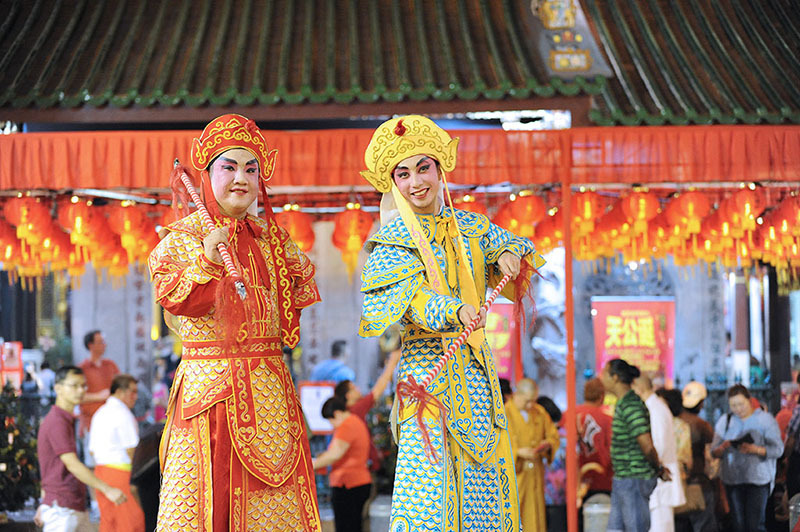 Dancers from the Singapore Hokkien Huay Kuan Dance Theatre perform this ancient dance at the temple in celebration of Confucius’ contributions and teachings. 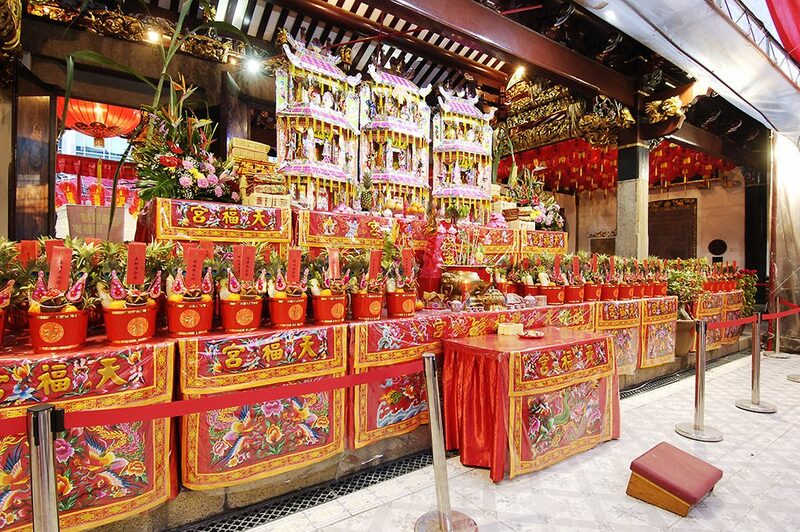 Thian Hock Keng continues to preserve the tradition of having a getai during important festivals such as the Birthday of Jade Emperor and Birthday of Mazu every year. 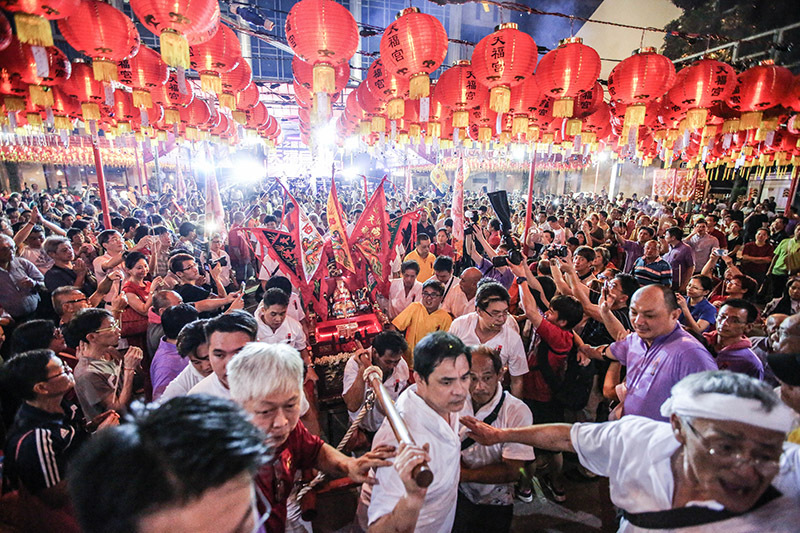 Getai performances are considered an offering to deities and spirits during the seventh month. For the first time in 100 years, Thian Hock Keng organized the Mazu’s Excursion for Peace on the birthday of Mazu on 29 April 2016 (农历三月廿三). 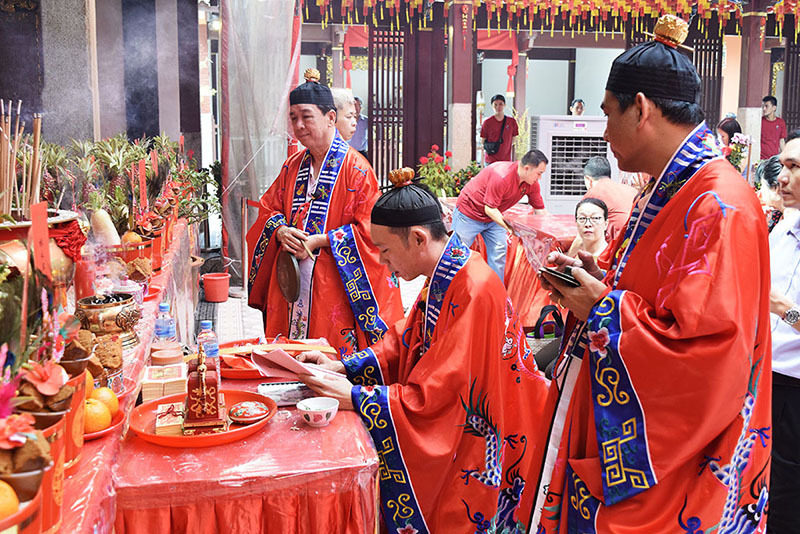 In conjunction with Thian Hock Keng’s 176th Anniversary and Mazu’s Birthday, a 6-day Festival “Journeys of Heritage & Faith” was organized to promote Chinese customs, traditions, culture and heritage. 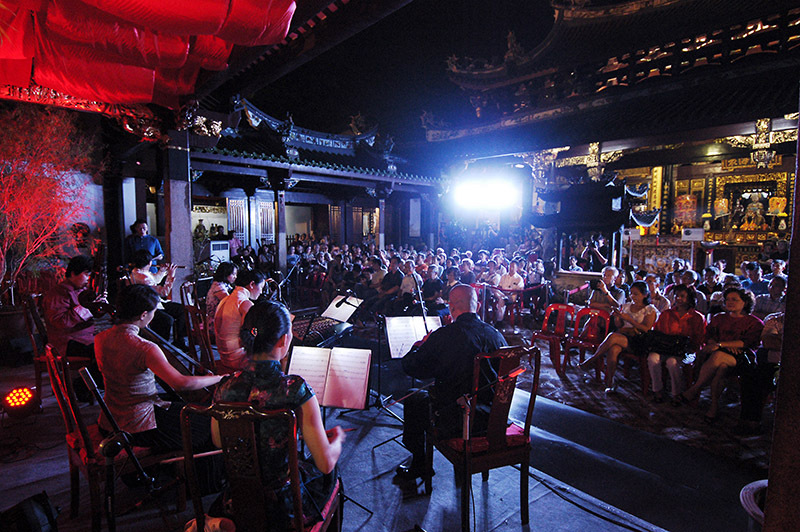 Thian Hock Keng organized Music In The Courtyard in 2016, as an expansion of continuing the traditions of Nanyin performances in the temple. 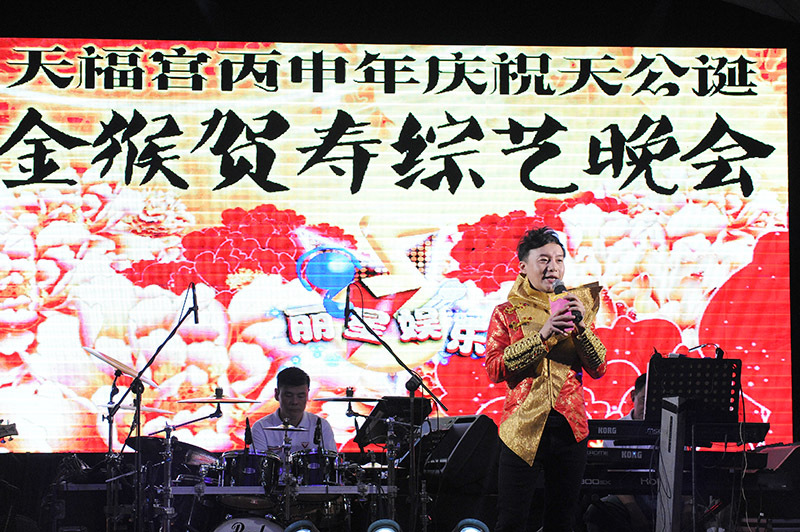 The public was treated to cultural extravaganza featuring Siong Leng Musical Associations, famous Taiwanese singer Yuming Lai and professional musicians from renowned Singapore Chinese Orchestra namely, Tan Chye Tiong, Zhao Jian Hua and Qu Jian Qing. Nanyin (南音) is an ancient Chiense music art form that traces its roots from the Han dynasty. It is commonly performed in temples and during festivals. 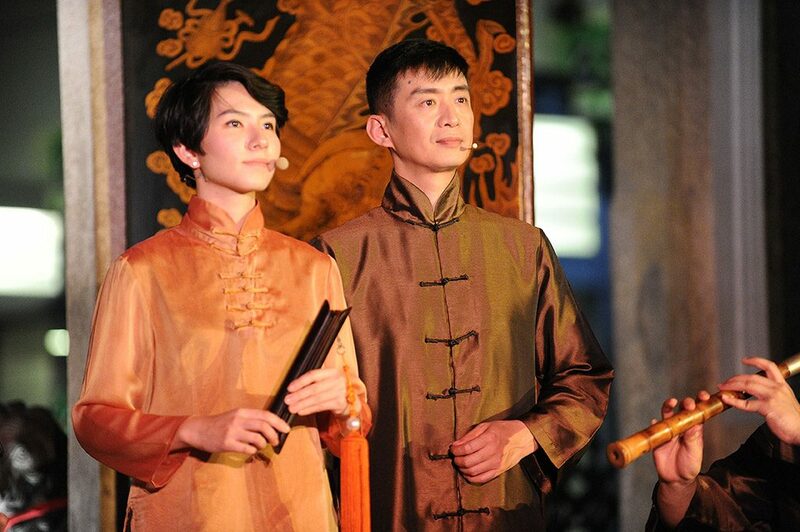 Thian Hock Keng invites Siong Leng Musical Association every year to perform Nanyin during important festivals such as Birthday of Guan Yin and Music In The Courtyard. Qing Ming Festival is a traditional Chinese Festival to show respect to ancestors. 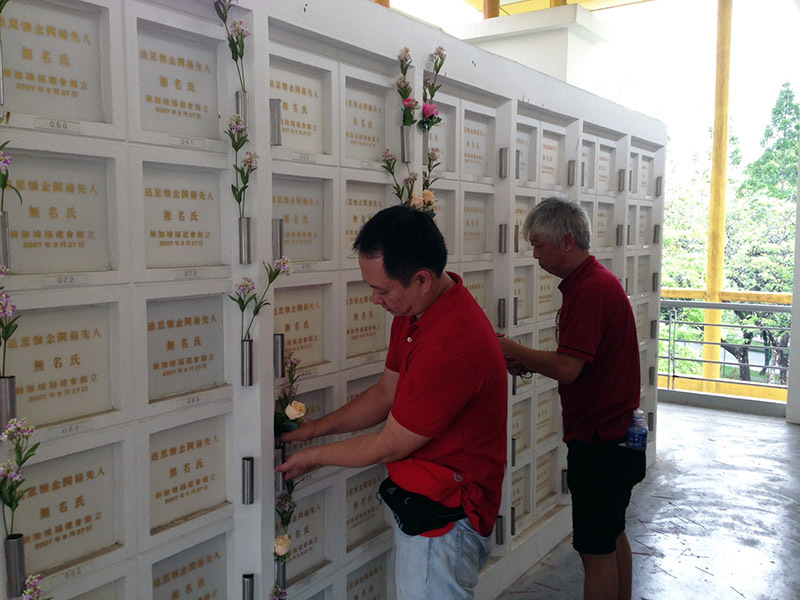 It is also known as Tomb Sweeping Festival. Till today, Singapore Hokkien Huay Kuan Thian Hock Keng continues the customs and practice to make offerings and clean the niches during the Qing Ming Festival. This happens during the 15th Day to 18th Day of Chinese New Year. In the past, cooked glutinous rice ‘kueh’ is used and shaped into a tortoise. However, packets of rice are used in place now. 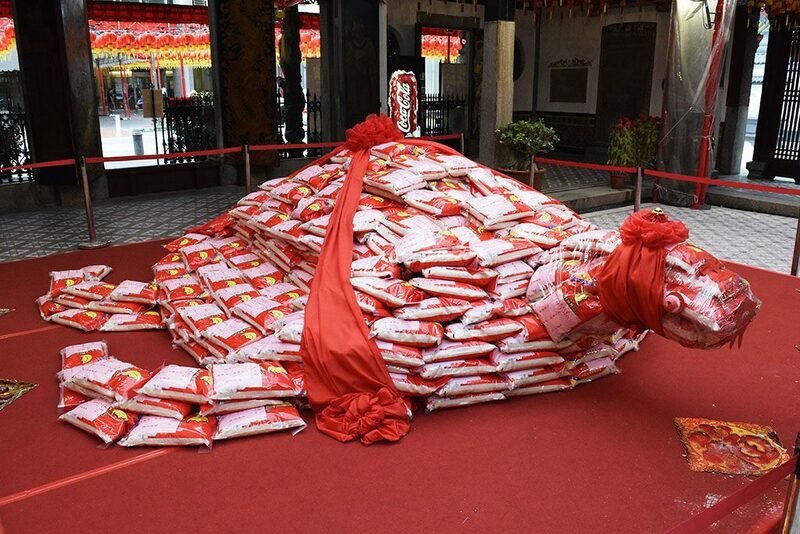 Devotees have to ask Mazu for consent to bring home a pack of rice and have 3 chances to “Pua Puay”. They are two red pieces of wood that are shaped like crescents, which come in a pair. It is flat on one side and concave on the other side. Devotees will then give thanks by returning a red packet during the next New Year. In addition, on the 15th Day of Chinese New year, there will be rice turtles which are made of flour and shaped like a turtle. It is an offering to the deities for longevity and peace. Thian Hock Keng follows an old tradition with devotees preparing a red packet with money for blessings or Ya Sui Qian （压岁钱）, in accordance with the devotee’s age where every 10 cents correspond to 1 year of age. This tradition has been retained for decades at the temple. Tai Sui is a Chinese term for the stars directly opposite Jupiter during its roughly 12-year orbital cycle. Those whose birth sign clash with Tai Sui of the year are advised to conduct a prayer session or, permitting peace and good fortune throughout the year. Thian Hock Keng organizes a temple fair during the eve of Chinese New Year. There is always a myraid of activities such as the Hokkien traditional string puppet show and stilt walkers during the night. Additioanlly, the temple does not miss out on the dragon and lion dance performance at the strike of midnight. Guided tours on Chinese customs and traditions, history and architectural significance of the temple are available during major celebrations at the temple. Traditional Puppet Show (传统木偶戏) is a form of performance or theatre that involves the manipulation of puppets to tell a story. 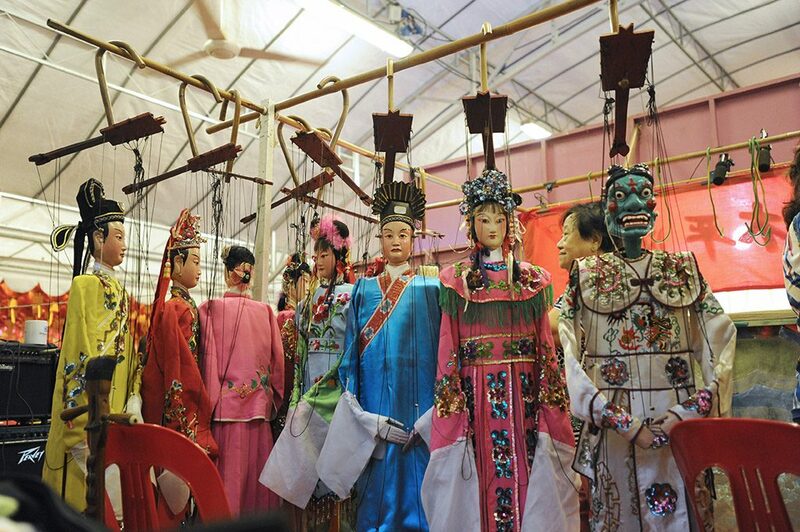 Chinese puppet shows have a long history that goes all the way back to The Three Kingdoms and has become an art. In today’s society, not many troupes performing this art are left. 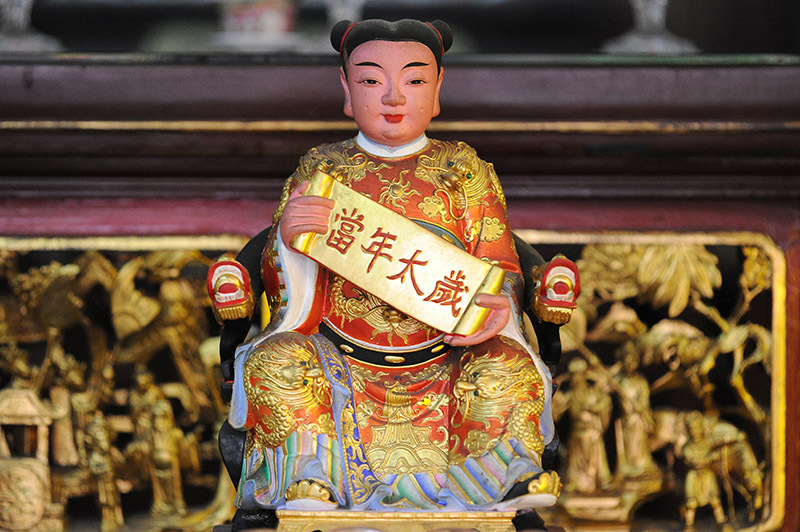 Thian Hock Keng continues to preserve this traditional art and puts up Hokkien String Puppet shows during important festivals such as Chinese New Year (eve and 1st day of CNY) and the Birthday of Mazu. Thian Hock Keng embodies the resilience and tenacity of our forefathers. It is a symbol of strength, camaraderie and our roots.